Most people don’t realize it, but the continental shelf is over 40 miles wide off Jacksonville, FL. The Ocean is 40 to 100 feet deep for most of that area off our coast and the vast majority of the bottom is just plain old SAND. There are areas of natural ledges and live bottom (areas of hard bottom with live corals growing on them), but most of the area is sand. 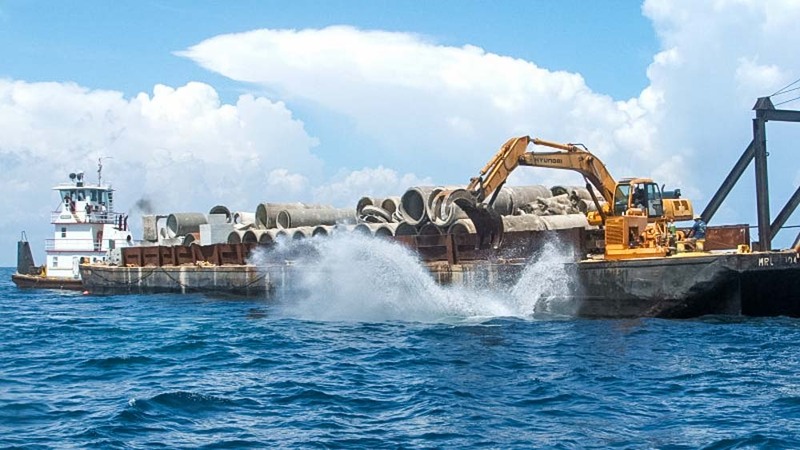 When the JOSFC sinks a boat, or dumps concrete culverts and rubble, we create a new reef that provides food and shelter for all types of marine life. In the case of the “Spike”, an old tug that we sank in the summer of 2009, it was sunk several hundred yards from the nearest existing reef. Within the hour, some fish had found it and were using it for shelter. One week later, it was covered with algae, and looked like a green shag rug. These algae provided food for lots of the small schools of bait fish, like Sardines, Cigar Minnows, Pinfish, etc. The bigger fish started showing up to feed on the bait fish. Within six months, both soft and hard corals, barnacles, and other bottom life like crabs, shrimp, and sea anemones will be taking up residence on the tug. Bottom fish, like Snapper, B-liners, Grunts, Sea Bass, Grouper, and Trigger fish will take up residence; followed by midwater pelagic fish like King Mackerel, Sharks, Barracuda, Wahoo, and Dolphin that can be found hanging around the wreck. During the summer of 2009, we also dropped a reef of concrete rubble and a separate drop of cement reef balls. (cast balls about 6 to 8 feet in diameter with several different size holes for the fish to swim in and out of). Each reef that we put down off Jacksonville creates more basic bio-mass increasing the habitat for the fish and increasing the numbers of fish. To date, over the last 50 years, the JOSFC has placed more than 270 drops and created a great sustainable sport fishery here. Sport fishing is responsible for over $600 million dollars in revenues for the greater Jacksonville area, each and every year!